Witiki has gorgeous, dense black fiber and an amazing head structure. She is a gentle female that has taken the role of mentor to the younger females of the herd. She is an amazing mother to her crias. She even "adopted" a cria that lost her mother, and nursed both this cria and her own. 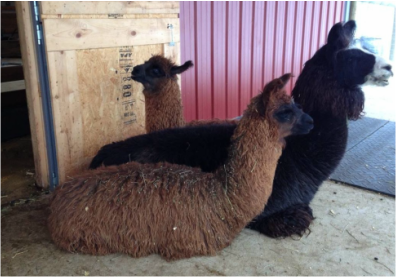 Argentine Witiki with her cria, Argentine Zelina, and her adopted cria, Argentine Bellatrix.